Be the first to share your favorite memory, photo or story of Conrad. This memorial page is dedicated for family, friends and future generations to celebrate the life of their loved one. 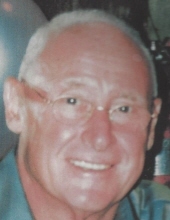 Conrad Meyer, 80, died February 2, 2019 at Robert Wood Johnson University Hospital, Rahway. Born in Jersey City, he lived in Jersey City and Kearny before moving to Carteret 20 years ago. He worked as a machinist for the Westinghouse Company in Belleville for many years before retiring 40 years ago. He is the Cherished father of Karen E. Meyer of Kearny and the late Rita Zambuta, the former husband of Karin Meyer, the adored grandfather of Jason Murray, Connie and Anthony Lombardozzi, the dear brother of Anna Slowinski, Barbara Castovinci, and the late Sue Krysiak, Elizabeth Kropp, Frederick Meyer, and John J. Kropp Jr., and the loving uncle of many nieces and nephews. The funeral will be from the Parow Funeral Home, 185 Ridge Road, North Arlington on Wednesday, February 6, at 9 A.M. thence to Our Lady Queen of Peace Church, North Arlington for the Funeral Mass at 10 A.M. A private cremation will follow. Visitation will be at the Funeral Home on Tuesday 4 to 8 P.M. In lieu of flowers please make donations to the St. Jude Children’s Research Hospital, P.O. Box 1000 Dept 142, Memphis. TN 38101. To send flowers or a remembrance gift to the family of Conrad Meyer, please visit our Tribute Store. "Email Address" would like to share the life celebration of Conrad Meyer. Click on the "link" to go to share a favorite memory or leave a condolence message for the family.